Check out the Steno Hero Crowdfunding Campaign! Our base funding level lets us finish Steno Hero with screen reader support and 12 playable songs, but our first stretch goal, which I'm REALLY excited about, lets us build an in-game song editor that will allow you to play Steno Hero using any game in your music library. Seriously, how amazing would that be?! And any money we get after that will go toward the development of other games in the Steno Arcade series, like the chord-hopping Stenogger, the single-stroke platformer Stenobolt, and the dictionary crunching Stenografius! 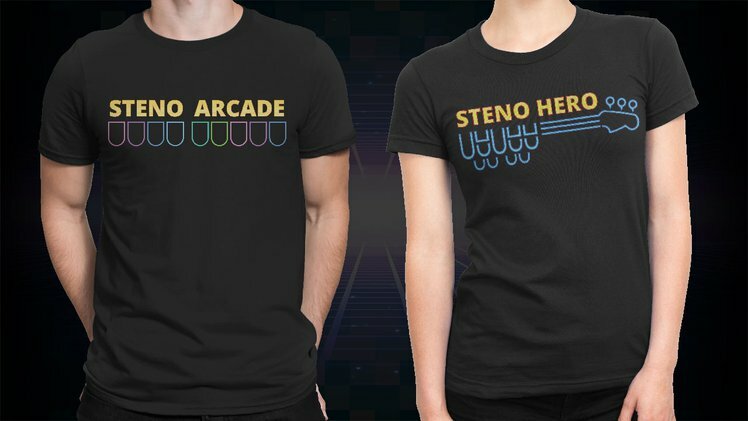 If you want to be a Steno Hero and help save the future of stenographic technology, contribute at the $35 level and get the T-shirt to prove it! Or if you want to kick in a little more, you could get your name included in the lyrics of a special Steno Hero song level that we'll be composing just for the game. There's even a level where you can get a little custom-built pixelated version of yourself getting funky in the Steno Hero crowd! Go check out the campaign, and if you've got a bit of cash to kick in, that would be amazing. Also many thanks for signal boosting this as much as possible, both online and off! When complete, the game itself will be 100% free for anyone to play, but the more funding we get, the more games we can build. Building an arcade site is the simple part, trust it or not. Getting guests to information exchange and have recreations is the hardest impact.